Evan Frank Lysacek is an American figure skater. He is the 2010 Olympic champion, the 2009 World champion, the 2005 & 2007 Four Continents champion, the 2007 and 2008 U.S. national champion, and the 2009/2010 Grand Prix Final champion. 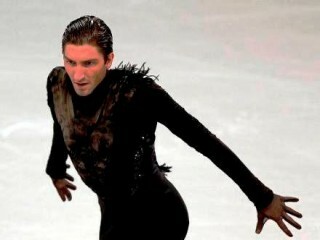 Lysacek was also a member of the U.S. Olympic Team at the 2006 Winter Olympics, where he placed 4th in the men's event. Lysacek was the United States Olympic Committee's SportsMan of the Year for 2010. He was also honored with the prestigious James E. Sullivan Award as the top U.S. amateur athlete of 2010. Evan Lysacek was born in Chicago, Illinois, and raised in Naperville, Illinois. His mother, Tanya (née Santoro), is a substitute teacher in Naperville, and his father, Don, is a building contractor. He has an older sister, Laura, and a younger sister, Christina, who played on a nationally ranked volleyball team. His cousin Cole Chason is a former punter for the Clemson Tigers. Lysacek graduated from Neuqua Valley High School in 2003. During high school, Lysacek was a member of the honor roll, where he earned a number of academic achievement awards, including the Presidential Award for Academic Excellence in 1999. Lysacek is of Italian and Czech descent; his great-grandfather Frantisek Lysacek, emigrated from Czechoslovakia to Chicago in 1925. He is a Greek Orthodox Christian, having stated that one of his most prized possessions is his Orthodox cross. He wears Graf figure skating boots. Lysacek moved to Los Angeles, California, in 2003 following his graduation from high school. He trains at the Toyota Sports Center in El Segundo, California. Lysacek studies acting, having taken method acting classes at the Professional Arts School in Beverly Hills. He appeared in the independent short film Skate Great!, playing a Russian Olympic gold medalist. Lysacek uses power yoga as conditioning training. Lysacek began skating at the age of eight. His grandmother had always wanted to be in the Ice Capades, so she bought him skates for Christmas. He originally wanted to play hockey, so his mother enrolled him and his sister Laura in figure-skating lessons to learn how to skate. Lysacek was soon competing as a figure skater. In 1996, Lysacek won the U.S. national title at the Juvenile level the lowest qualifying level in the U.S. Figure Skating competition structure. In 1997, he moved up to Intermediate and won the pewter medal (fourth place) at the Junior Olympics, after winning both his regional and his sectional qualifying competitions. After failing to qualify for Nationals on the novice level in 1998, Lysacek won the U.S. Novice title at the 1999 U.S. Championships at the age of thirteen. View the full website biography of Evan Lysacek.